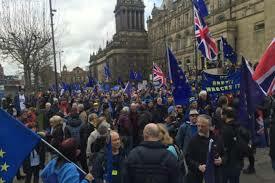 Thousands of people have marched through Leeds in protest against Britain leaving the European Union. Campaign group Leeds for Europe, which organised the rally, is calling for a second referendum on Brexit. Lord Andrew Adonis and philosopher AC Grayling joined protesters as they demonstrated through the city. The Department for Exiting the European Union (DExEU) said an agreement had been reached on exiting the EU. Richard Wilson, from Leeds for Europe, said: “I think a lot of people feel very strongly about it. We’ve met a lot of people over the past year. We’ve been in the streets of Leeds every week since the start of last year. “A lot of people are very concerned about the way it’s going and are having second thoughts to be honest. We need to give people the chance to express those thoughts, ideally in another referendum. A DExEU spokesperson said: “The people of the United Kingdom have already had their vote in one of the biggest democratic exercises this country has ever seen. “The agreement we have reached this week at the European Council meeting is another significant milestone in our path out of the EU. “Securing a time-limited implementation period, based on common rules, provides businesses and citizens with the certainty they have been asking for. Protesters marched along the city’s streets starting at The Headrow and followed a 2km route through the centre. West Yorkshire Police said about 2,000 people attended.